Made from the finest Vuelta Abajo tobacco, the Siglo II is inviting to look at, tender to touch and a treat to the palate. 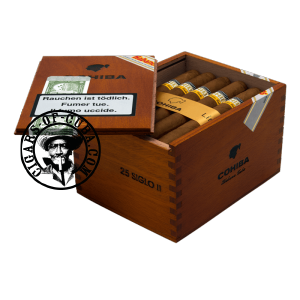 This Petit Corona sometimes seems out of place among the other more attractive Cohiba vitoles, but this small cigar works hard to make its mark. Cohiba have worked hard to give this smaller cigar a character all of its own. Honey and Cohiba's trademark grassy qualities are clearly apparent in the first half of the smoke. The second and third phases release cocoa and vanilla beans on to the palate through an impressively thick smoke. It's the most popular Havana format in the world. It's dimensions are appropriate for any moment and it is the perfect cigar to have at all times. It burns well. It has a woody taste with some harsher notes. The Siglo II does not offer a large variety of aromas and this is due to its size, but it is generally agreed to be one of the best Petit Coronas on the Cuban market. A short final. Dry and spicy.